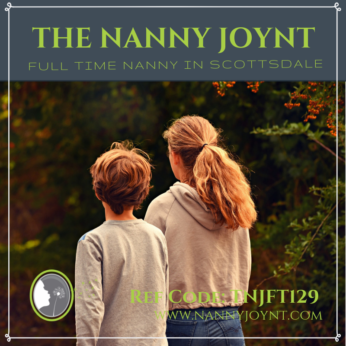 The Nanny Joynt is working with a wonderful, FUN and active family with 3 teenage children in Scottsdale. Their oldest daughter is 18 and manages her own schedule, she is very independent, funny and easy to get along with. She is on the track team and is very close with her younger brother. Their middle child is 15 years old, he has a strong personality and needs some help keeping focused and on the right path. He does online school and is on the track team and plays soccer. Their youngest daughter is 12 years old and is a very happy girl, she needs some help with school and study encouragement and loves to be busy. She too is on the track team. She is spunky and fun and excited to meet their new nanny! A nanny who is vibrant, upbeat, active and can handle a busy household is needed for this family. On an average day you will be picking the middle child up from tutoring and helping him get ready for track/soccer, doing some meal prep and then picking up their middle child from school. You will be helping with homework, and making sure the children help around the house with their tasks and driving them to activities as needed. The schedule for this position will be Monday through Friday and will guarantee 40 hours week. There will need their nanny to be available for occasional weekends and overnights when Mom travels for work. Some travel with the family as well to some awesome destinations! Overnights will be needed on a pretty regular basis sometimes up to a week at a time. Additional compensation will be paid for overnights and travel. There is some flexibility with this schedule should the nanny they hire wish to be off one evening earlier. Also once Soccer season is over the nanny will not be needed until 9pm 3 days per week. The amazing position is offering a generous $45,000 – $50,000 per year (20-25/hour), with guaranteed hours, paid vacation, paid holidays, paid sick days and they can also offer health and dental insurance, and use of family vehicle!!! Mom and Dad are both in the restaurant industry and have very busy schedules. Mom can be in and out during the day, but typically works away from the home. They need a nanny who is reliable, dedicated, firm but loving and hands on. A nanny who will engage with the children and build a lasting friendly relationship with them is desired. They would love a nanny who is genuinely invested in their kids well being. The ideal candidate for this position will have an outgoing personality, jokes with their children and is super fun! The nanny should become friends with the children, but also keep structure and keep them on track with school and their activities. They want their nanny to be engaging and plan activities for the children, such as, the mall, movies, ice skating and going out for ice cream. This is a very active position so a nanny who is active and involved is required. The kids are active and in sports so a nanny who will play/run with them would be perfect! Child related duties will include all childcare related duties for the children. The nanny will be responsible for meals, packing lunches, organizing, keeping the children on task, having them help out with chores, homework help, driving to and from sports and activities. Planning of activities weekly will also be the responsibility of their new nanny. Household responsibilities will include helping with laundry, light house cleaning, such as making sure the kitchen is wiped down, load/unload dishwasher, preparing meals and lunches, making healthy snacks, tidying and keeping things organized and neat as needed. You will need to keep items stocked and put away, grocery shopping, meal planning, errands, dry cleaning, etc. This family does have a house cleaner who comes 5 days per week for deep cleaning. This family is looking for a dog lover!!! They have 3 dogs, one Maltese who is just a puppy, a 3lb Yorkie and a year old Begian Malinois. They would love help to make sure the pets are taken care of, fed, watered, let in and out, etc. NANNIES!!! Incredible family ALERT! However lands this position will be so loved and taken care of! They are a sweet and loving family who like to have FUN! They want their nanny to be able to connect and form a bond with their children and family. Someone who will have a hands on approach and can focus on the children each day. This is a really fun and active family who are amazing employers and value their nanny in the home. They are easy to communicate with and would like a nanny who loves her job and will put her heart into her work each day! They are excited to meet their new nanny and start this journey! To be considered for this fantastic opportunity please email your resume to trisha@nannyjoynt.com please use Reference code – TNJFT129 in the subject line. Interviews will begin ASAP.